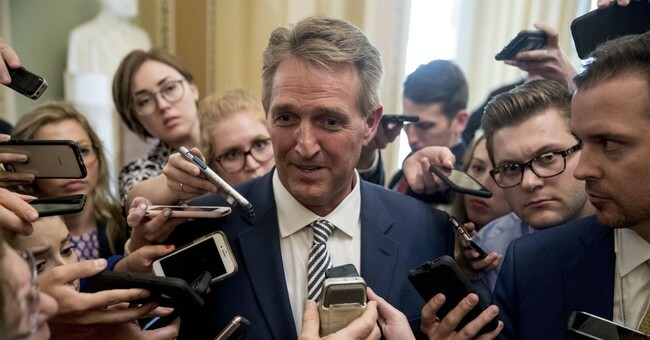 Let's start with Flake, who saw the writing on the wall vis-a-vis his own party's voters and chose to call it quits rather than standing for re-election, leading to a Democrat winning his seat. If you haven't been following his latest maneuvers, he's been pushing hard for the 'Mueller protection' bill, insisting that he'll hold up all Trump judicial nominees until the legislation gets a floor vote. He's not bluffing. Many conservatives, including some who are not Trump acolytes, say the bill is blatantly unconstitutional. It has thus far been scuttled by Mitch McConnell and other GOP Senators, most prominently 2016 Trump critic Mike Lee. Flake's stance is that defending the rule of law is worth obstructing other priorities, so he's using his not-insubstantial leverage to force the issue. “It is not productive,” said Sen. Ted Cruz (R-Texas), who has also been known to cause major headaches for McConnell. “One of the greatest substantive victories that we have delivered for the American people the last two years is nominating and confirming strong constitutionalist judges. For a Republican senator to be blocking that is frustrating the promises we made to the voters...Sen. Thom Tillis (R-N.C.), a leading Farr backer and co-author of the Mueller protection bill, acknowledged that “you can’t not be frustrated when you see nominees that were voted out of committee with Senator Flake’s support now being held up. On, incidentally, a policy matter I support...I just don’t see any path to success, and in the meantime we’re holding up a number of qualified judges that Sen. Flake voted out of committee,” Tillis added. [Flake's grandstanding] is annoying, for the simple reason that it’s obviously futile. Flake has leverage to inconvenience his caucus but not to actually stop them from doing what they want to do. He can push the confirmation process into next year, but that’s it. And his pet priority in this case, the cause of protecting Robert Mueller, has no chance whatsoever of becoming law. Obstruction to no meaningful end smells a lot like spite. And let’s face it, obstructing judicial confirmations is about the worst thing a Republican in Congress nowadays can do. This garbage party exists for three and only three reasons anymore: Protecting Trump, cutting taxes, and remaking the federal judiciary. They’ve already got the first two covered and now here’s Flake screwing with the third. Just wait until the government shutdown deadline is upon us in a few days.